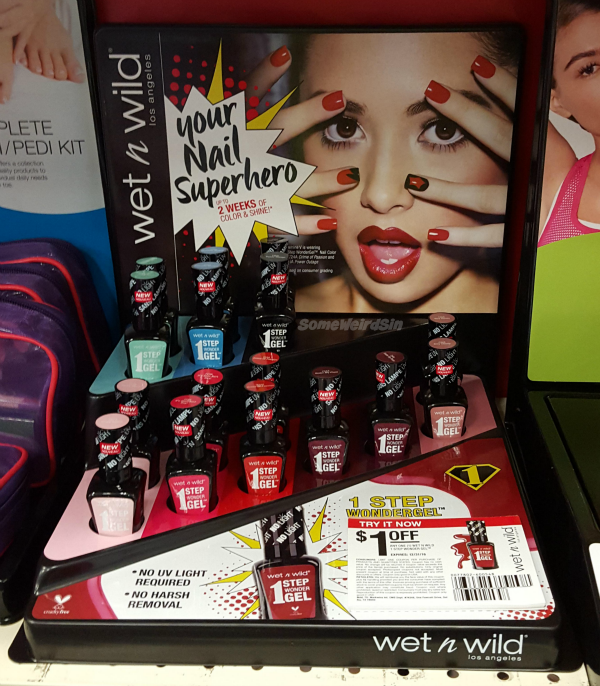 CVS - $3 EB when you buy 2 Wet n Wild Wonder Gels. $3 EB when you buy $8 of Rimmel. Rite Aid - The usual. Walgreens - Nothing of note. Just one new shade in this collection, but it's a good one! Lots of glitter and shimmer. 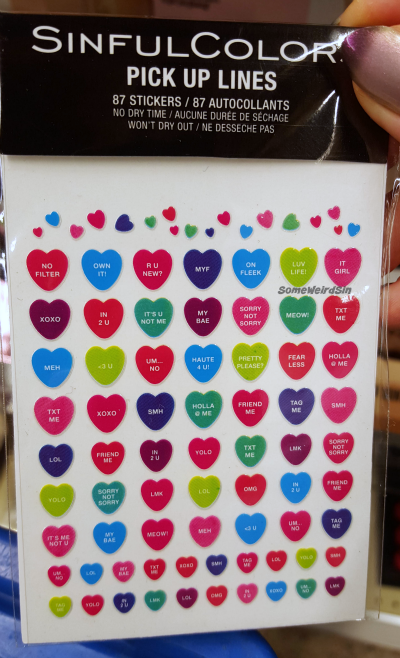 I should have swatches of Love Bombs up soon, maybe even this week. Maybe. 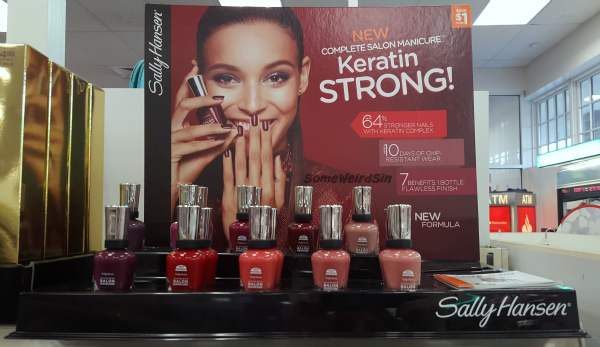 There are repromotes of two popular shades here too, Sail La Vie and Pink Smart. 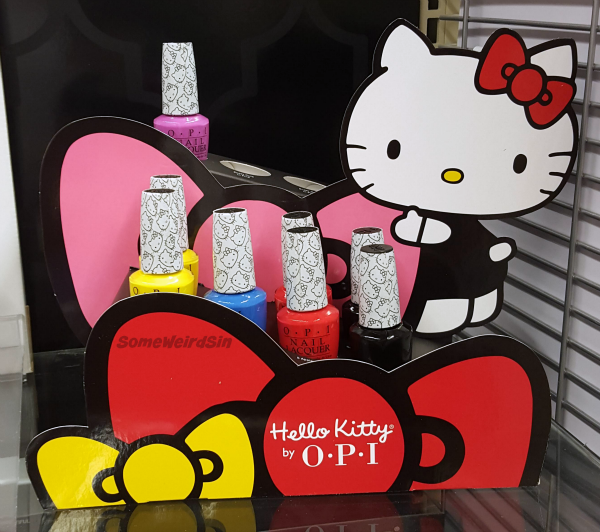 For my fellow Mid-Atlantic'ers, the Hello Kitty collection is showing up at Wegmans...and instantly being picked over. What else is new? 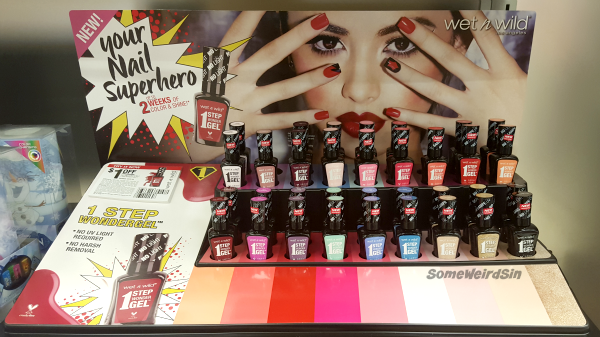 I'll tell you what's new...no-lamp gel from Wet n Wild. They're a late entry, but considering how nicely pigmented their regular creams tend to be, I'll be trying a few of these out for possible stamping potential. By the way, whoever set up this particular display really missed a big hint, didn't they? This girl or guy got the hint and did this smaller display right. Typing these names again, a couple of the puns finally sunk in. I get it now. Both the small and large displays have $1 off coupons (good ALL YEAR) on them, but if you happen upon them at CVS, there's an ExtraBucks deal going too. This week you could get two of them for $9 with the coupon and $3 in ExtraBucks. Not too shabby! 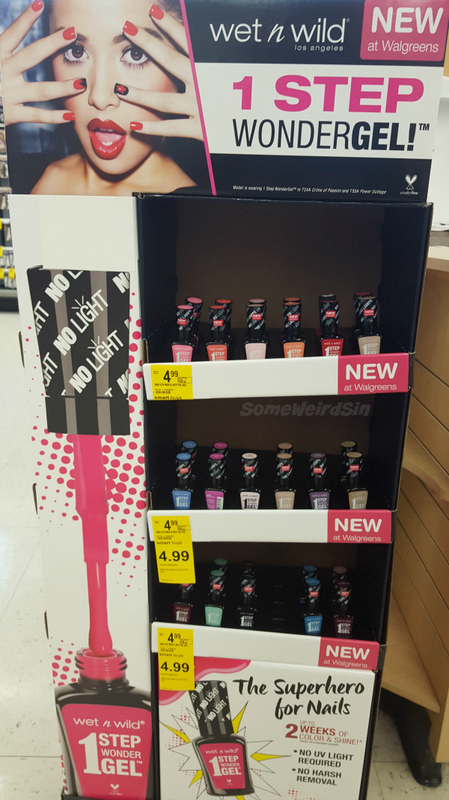 Walgreens went BIG with their display, but doesn't seem to have more shades than the ones I found at Rite Aid. What they do have is this endcap full of all kinda of new makeup things. I'll probably be all over this once they have a sale. Does eeevery brand have to do a bohemian collection? Is there some kind of rule? Still, as spring pastels go, these manage to be a little different. There's also a...yay...bar glitter topper. Woo. This turned up around xmas, but I figured it's worth noting, since it's got a coupon for $1 off any Complete Salon Manicure shade. The coupon is good through 2/29/16 and doesn't specify (or even mention) the reformulation. This is, what, the second or third reformulation for this line in less than four years, isn't it? Oh and if you're wondering about the question mark in the shade name list, that's Violet Glass from last fall. It's filling in for whatever was meant to go there and doesn't belong in this display. 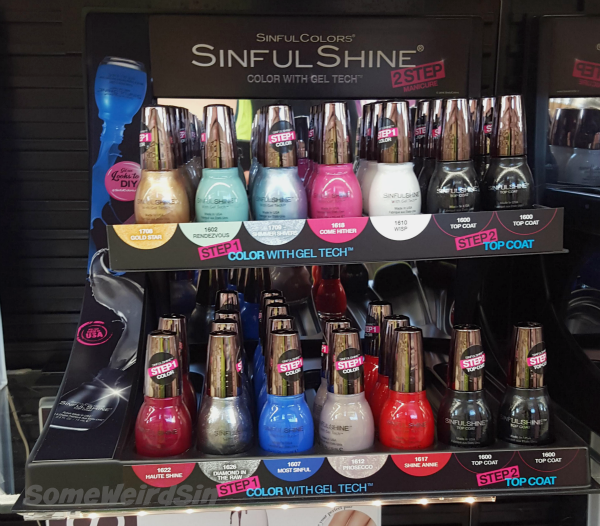 Another variety of SinfulShine self display. Prosecco's in this one too, but I'm more excited to see Wisp return. It's one of the best white creams I've tried. 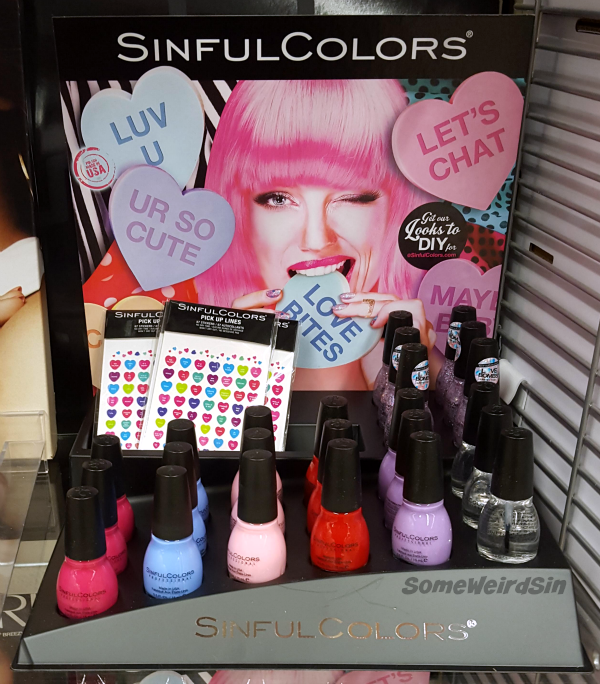 There are some major changes coming to the Sinful Colors core display soon. At least 16 shades are being dropped, some of which have been in there since I started paying attention. The Sinful Colors site lists some new shades, but not enough to fill in all of the blanks. Hmmm. Oh and Devil's Stare is coming back!! Yay! 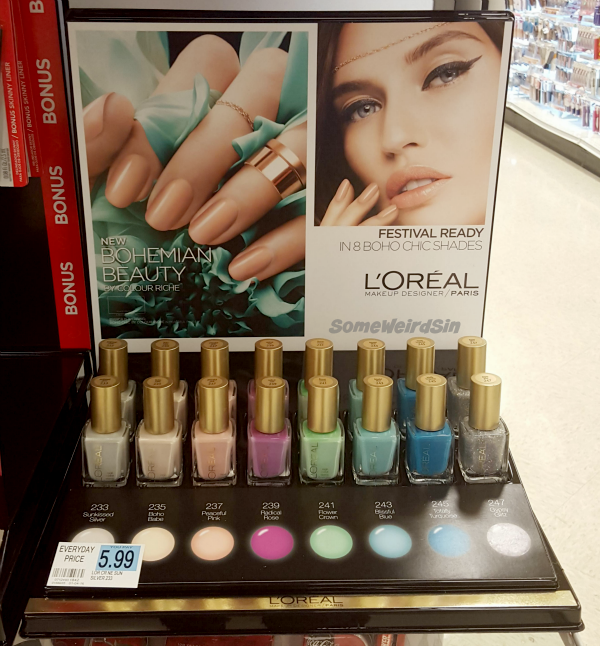 Wegmans DC'ed Maybelline Color Show!? Getting regional again, but I find this interesting and confusing. New polish? No polish? I'll be watching this spot. Looks like I'll be posting another one of these next week because I found even more new stuff between starting and finishing this post...but that's something for another day. I love this time of year for shopping!